My first-ever tablet was the first-generation iPad. 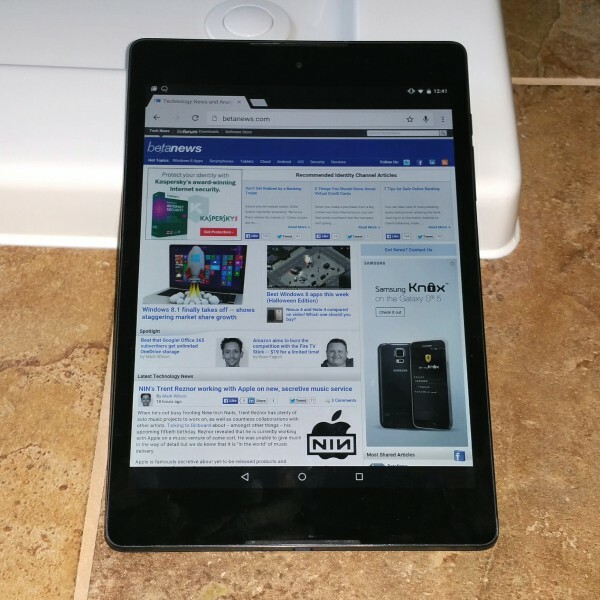 I loved Apple's tablet very much, but ended up selling it to buy the Nexus 7. My decision made sense, as the iPad was nearing end of life, while Google's tablet was just beginning. The Nexus 7 was awesome, but it lacked the same magic as Apple's tablet. Yes, I am using the word magic to describe the iPad, a much maligned word for Apple's detractors. To explain, the "magic" I speak of, was the emotional connection that I had with iPad; something that did not exist with both Nexus 7 models. Don't get me wrong, both Nexus 7 tablets were great and functional, but also cold and smartphone-like. Now Google releases the Nexus 9 and it finally has the feature I desire most -- magic. 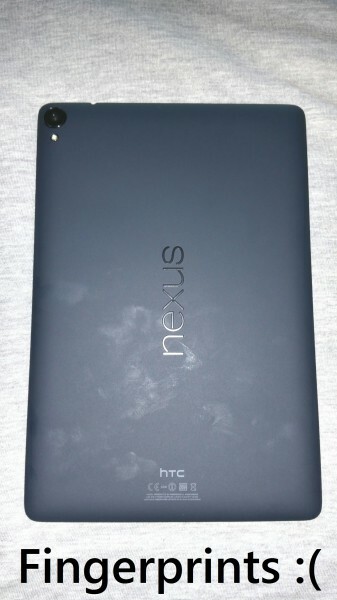 Upon removing the Nexus 9 from the box, I was immediately impressed with the build quality. The nerves in my fingers transmitted a feeling of euphoria to my brain. The tablet is thicker than I anticipated, but not overly; heavier too, but again, not overly. The unexpected heft and thickness added to the feeling of quality and satisfaction. The edge of the tablet is metal and angled -- cold to the touch. The rear, however, is soft and rubber-like -- still cold, but less so. These materials combine for a premium experience that feels great in my hand. The rear has the added benefit of making it secure in the hand, so as to not slip and fall to the ground. Sadly, the soft-touch material is a fingerprint magnet, as can be seen below. As is expected, it charges by microUSB, and there is a port for such on the bottom. 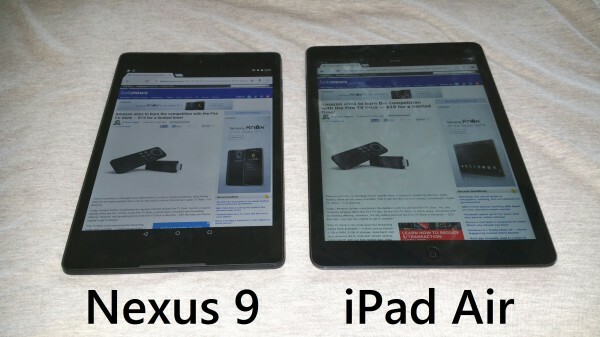 As on the Nexus 7, it is curiously in a reversed position, opposite of most devices. The left of the edge is bare, while the right holds the power button and volume rocker. The top is home to a 3.5mm headphone jack. Sadly, there is no port for a microSD, so other than a clunky USB OTG cable and a flash drive, expanding the memory is not possible. Arguably, both the cloud and streaming media services have generally rendered the need for expansion unnecessary. With that said, the Nexus 9 comes with either 16GB ($399) or 32GB ($479) of storage. While 16GB is passable, I would prefer 32GB as the starting option instead. Sound is absolutely incredible, as the tablet has dual front-facing stereo speakers, much like the lauded HTC One (M8). 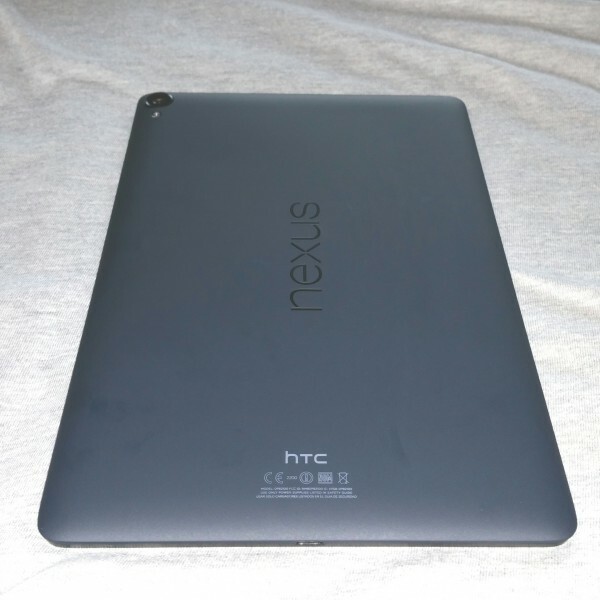 This is no coincidence, as HTC is the manufacturer of the Nexus 9, and the M8 has the same styled speakers. Plus, the Motorola-built Nexus 6 has front-facing speakers too, so it is understandable that Google would keep its newest phone and tablet similar. As great as the speakers are, equally impressive is the gorgeous display. Colors are vivid and not washed-out, leading to a great experience viewing photos and websites alike. Videos are especially impressive, as the beautiful display, matched with the front-facing speakers create a wonderful cinematic experience. The best thing about the display is not the quality, but the aspect ratio. Google has finally come to its senses and chosen to go 4:3, the same as Apple's iconic iPad. Sure, 16:9 may be better for movies, but many people spend more time surfing the web and using apps on their tablet than watching movies. In other words, you shouldn't negatively impact all other tablet uses for the sake of movies. The Nexus 9 just feels natural now, black bars during movies be damned. Probably the coolest feature of the Nexus 9 is one that won't be realized in the short term. You see, this is the first 64-bit Android device running 64-bit Android. It is powered by Nvidia's Tegra K1. Consumers won't see any benefits initially, but this makes the tablet future-proof, and will guarantee compatibility with future apps that are 64-bit only. For now, it is really nothing more than bragging rights. Regardless of 64-bit, the processor is extremely capable and Android is buttery-smooth on the Nexus 9. Never have I experienced a lag or stutter. The all-new Android 5.0 Lollipop and this tablet are a match made in heaven. Gaming in particular should be amazing, once developers start taking advantage of the 192-core Kepler GPU. Existing games run great on the Nexus 9, but I think future games will reveal the true power. Battery life is impressive, and the Nexus 9 handily outperforms the Nexus 7 in this regard. Unfortunately, it still is no match for the class-leading iPad Air, which has an Energizer-Bunny-like battery, which keeps going and going. Still, even though the battery does not last as long as Apple's, it is still much better than most Android tablets. My only disappointment with the Nexus 9, is the lack of Qi wireless charging. This was one of my favorite aspects of the Nexus 7 -- just lay it on a charging pad and no need to fiddle with a cable. 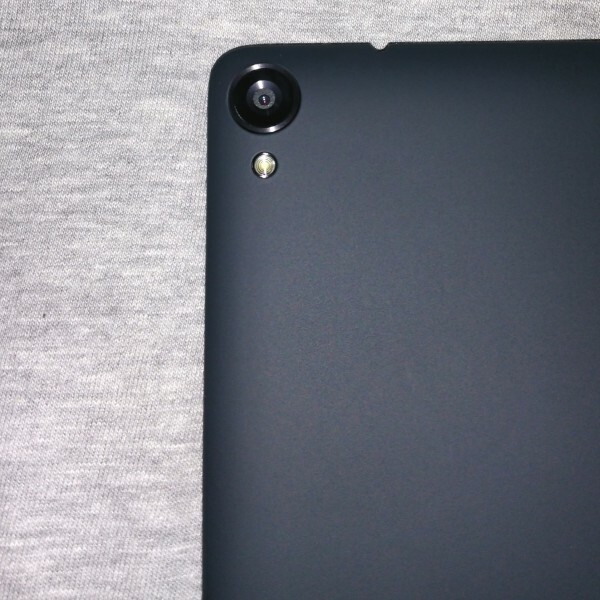 With the Nexus 9, the technology is absent, but it may be by design. You see, the larger size makes it a bit too large for tiny charging pads. Plus, wireless charging is slower than using a cable. Think about it, slow charging and a large battery could lead to a negative perception by owners. The rear camera is surprisingly good; much better than expected on a tablet. The flash works well, and pictures taken in low-light conditions are passable, yet a bit grainy. It is still a faux pas to use a tablet as a camera in public, but in a pinch, it is totally usable. Regarding the front camera, taking selfies worked well, but since I am no George Clooney, I tend not to take them often. When communicating by video on Hangouts, the other party reported that my image appeared bright and clear. This is a good thing, as some front-facing cameras can perform poorly in low-light during video. If you want an Android tablet, this is the one to buy. Unfortunately, there is one big problem -- the price. Starting at $399, this is hardly affordable. If you can afford it, absolutely splurge -- it is that good. However, if you are on a budget or simply adverse to spending money, there are other great Android options at many price points. Hell, the 2013 Nexus 7 is still a smart buy and it may even see price cuts as consumers upgrade to the Nexus 9. Price aside, the 64-bit processor, front-facing stereo speakers and solid build quality make this a huge winner, and the best Android tablet for the time being. If you want to experience Android 5.0 Lollipop, this is the device to showcase it. There truly is magic inside the tablet and you will not be disappointed. Extremely recommended.